The Deck-Mate flashing incorporates a stepped profile which creates a compression seal between the schedule 40 piping and the flashing. Designed with proper reinforcing ribs to allow the flashing to maintain rigidity and the shape of the product. By combining the stepped profile and the reinforcing ribs, the product will properly accommodate the use of a stainless steel clamp. The clamp is crucial in maintaining a water-tight seal for years to come. All other products on the market incorporate the use of caulk to seal the penetration. The National Roofing Contractor Association states, in their better roofing practices, that caulk should never be used as a primary sealer of a penetration. The Deck-Mates are designed to accommodate projections from .125"-26" in diameter and work in conjunction with any configuration of corrugated metal roof. The product is engineered to incorporate a dead soft aluminum flange that bends to any contour, roof irregularity or pitch. Deck-mate is available in two styles, the standard for normal penetration, and Retrofit for piping that can not be disconnected. Flashings are also available in two materials, standard EPDM, and high temperature Silicone. Furnish and install atall points where 26" or less pipes penetrate the metal roof and wall system. The Deck-Mate shall be EPDMor Silicone (high temperature) compression molded rubber. Material shall have a serviceable temperaturerange of -60 F to +270 F for EPDM and -100 F to +500 F for Silicone. Both products will be resistant to ozone and ultraviolet. Unit shall have 1" wide corrosion resistant flexible aluminum base. D.M. 0 .125"-.75" .75" 2.25"
D.M. 1 .25"-2" 3" 4.5"
D.M. 2 1.25"-3" 4" 6"
D.M. 3 .25"-4" 4" 8"
D.M. 4 3"-6" 5" 10"
D.M. 5 4"-7" 5" 11"
D.M. 6 5"-9" 6" 12"
D.M. 7 6"-11" 6" 14"
D.M. 8 7"-13" 6" 17"
D.M. 9 10"-18" 8" 25"
D.M. 10 13"-26" 8" 34"
RPS Deck-Mate Flashing Systems are designed to accommodate pipes from 1/8" to 26" in diameter and work in conjunction with any configuration of corrugated metal roofing or wall systems. The flexibility of the EPDM rubberflashing allows for both vertical and horizontal pipe movement, yet provides a maintenance-free permanent installation. To form a positive seal with the metal roofing or siding, the Deck-Mate is engineered and manufactured with a flexible aluminum base which can easily be conformed to any contour or irregularity in the underlying metal panels. To prevent any possible corrosive effects with the aluminum flange, the rubber boot is fully molded under the aluminum providing a barrier between the aluminum flange and any dissimilar metals. In addition, the rubber under the aluminum flange gives assurance of an added seal between the Deck-Mate and the panel. Field attachment of the Deck-Mate to the panel is simple with silicone sealant and standard sheet metal fasteners with rubber washers. Provide premanufactured Deck-Mate flashing systems as manufactured by Roof Products & Systems, Bensenville, IL, at all necessary roof penetrations 26" or less, or as shown on drawings. 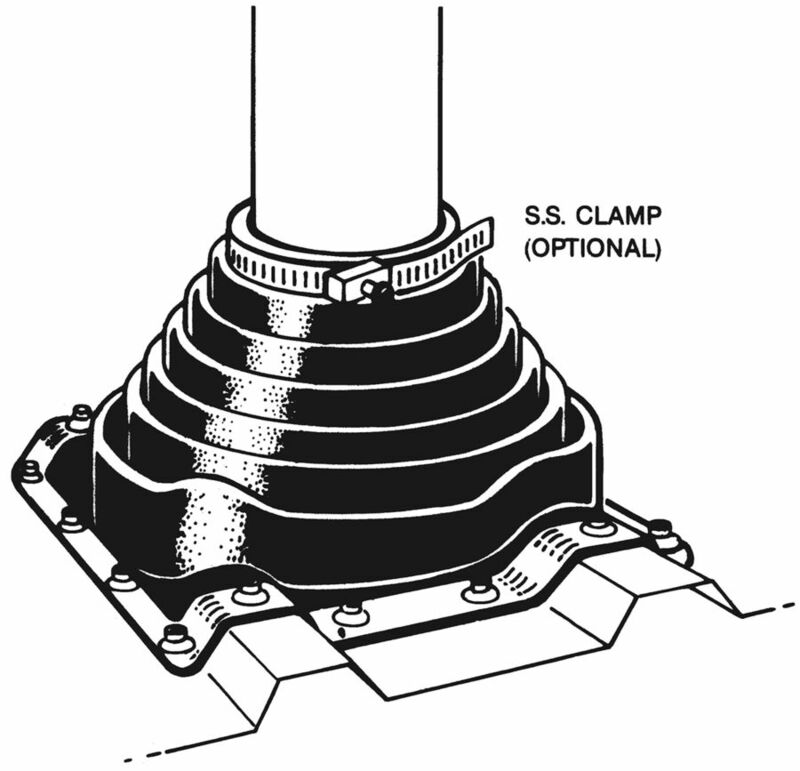 Each Deck-Mate flashing system shall include a molded EPDM pipe boot with stepped sides to accommodate various pipe sizes with an integral aluminum flange. EPDM rubber shall have a serviceable temperature range of -60°F to +270°F and be resistant to ozone and ultraviolet rays. Each Deck-Mate shall include a stainless steel clamp for positive securement of the Deck-Mate to the pipe.